ABB and Helsinki City took a big leap in autonomous shipping after successfully conducting the first trial in Finnish capital’s port last week. In a world first, ABB tested the enhancements of ship operations with technologies that are already available for nearly any kind of vessel. "We are excited about the potential impact of this test on the future of the maritime industry," Peter Terwiesch, president of ABB’s Industrial Automation division, says. "Advanced automation solutions from ABB are making the previously impossible possible for a wide range of sectors, including shipping, which is actively searching for technologies that can rapidly deliver more efficiency and better safety." "Autonomous does not mean unmanned. As vessels become more electric, digital and connected than ever before, ABB is able to equip seafarers with existing solutions that augment their skillsets. In this way, we are enhancing the overall safety of marine operations," said Juha Koskela, Managing Director at ABB’s Marine & Ports unit. Suomenlinna II was retrofitted with ABB’s new dynamic positioning system, ABB Ability™ Marine Pilot Control and steered from a control centre in Helsinki. 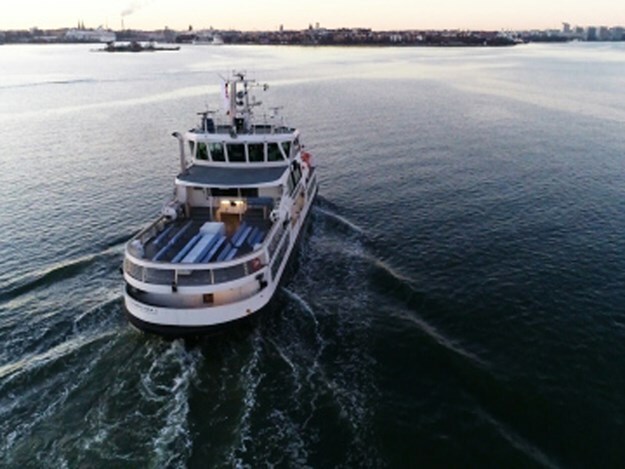 For the trial, the ferry departed from Helsinki’s market square, Kauppatori, and Captain Heinonen wirelessly operated the ferry with ABB Ability Pilot Control through a pre-selected area of Helsinki harbour. It took place during the vessel’s off hours and away from shore with no passengers aboard.